New sign. New decor. New owner?? Thankfully not! Although I will forever miss the rusty old nostalgic sign, the newly remodeled taco-bellish building is a good sign for Umemura's future. I'd like to think I had a hand in it (see 2007 rankings), but Umemura has survived for years (long before my little blog) and it's no surprise that it still remains popular today. As I begin to round out the year in preparation for another year-end ranking, why not start with Umemura to see if anything had changed (other than its remodel), I thought. I won't bore you on my history with this place (since we took care of that the last time), but I will say that last year's review has consistently been in my blog's top 5 most-visited-pages every month. Hopefully, you enjoyed it as much as I did. The thick gravy from the sauteed toppings gave the normally mellow shoyu base an injection of high octane flavor--a flavor that coated the "homemade" noodles for extra slurping power. There are too many toppings to name (pork, cabbage, mushrooms, carrots, etc...) so you'll just have to pick 'em out from the pics. I'm not sure how true their "homemade" claim is, but their crimped noodles tasted fresher than ever before and looked similar to homemade mass-produced chuuka soba that I've seen in Japan. ...I dumped it into my remaining soup. Ahhh, now this is some good chahan! Don't be afraid to mix and match! Nice review! :) I've been meaning to make it out to Umemura for quite some time now (ever since I saw your rankings last year (^_~)). And would you say I skip the rest of the flavors and only try their Umani? Gosh, now I'm craving it, damn you! @Exile Kiss: Yes try the Umani first and then try the rest if you like. You *may* find it a little salty but I don't think they use msg (no guarantees though). 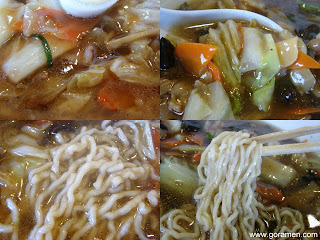 Overall, I think it's about the same but the noodles did taste a little better than when I went earlier this year. @So Cal Peeper: Glad to hear from you. 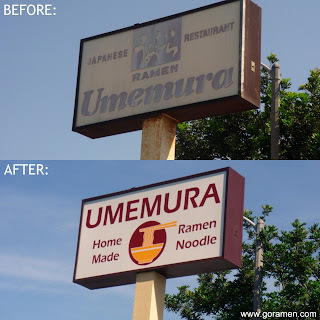 Haha...you got the itch for ramen...mission accomplished!